Re: Latest Inflation figures released. odysseus2000 wrote: As rates rise bonds become more attractive for income seekers who buy and this leads to more money going out. Fresh lending only though. A Government or a Company that has borrowed in the past but has no need to borrow in the future doesn't suffer any change in cash flow as a result of interest rate rises or falls. It's only when it has borrowed in the form of an overdraft or similar that it will be paying out more. odysseus2000 wrote: Look at e.g. the US treasury payments as rates rise and you will find it goes up. Only for new issues. The rest stay the same. Let us not forget that Bond markets are many times larger than equity markets and are very liquid. The effect of interest rate rises is significant just by the weight of money in bonds. If it wasn't so central banks would not use interest rates as a weapon. The effect of ultra low and negative interest rates was not inflation as many suggested, but deflation: Too little money chasing too many goods. Similarly the effect of interest rates rising will not be deflation but inflation. One should also see currencies weaken as rates rise, not strengthen as the effect of more money going into the system is to lower its value as prices rise. odysseus2000 wrote: The effect of interest rate rises is significant just by the weight of money in bonds. If it wasn't so central banks would not use interest rates as a weapon. Interesting then, that central banks use interest rate rises as a counter to inflation. Also that currencies rise when interest rates rise. Why do you suggest the opposite? Odysseuss said - "One should also see currencies weaken as rates rise"
Are you saying that if interest rates rise in the US, then the $ will weaken ? If interest rates rise in the UK and the US will the £ and the $ both weaken - say against the Euro. ? I find this prediction quite incredible - why would that happen ? The standard media view is that any rise in interest rates will cause the currency of the nation raising rates to strengthen. So if we look at the relation of say the Japanese Yen and the Euro to the $ we should expect after the recent Fed’s triple raise that the $ will have strengthened against both. For the Euro there has been little change in the US $ even after the 3 rate hikes and all the political problems in Europe. For the Japanese Yen the $ has fallen despite the rate rises. One can argue that these charts are not reflections of US rates, but of issues in Europe and Japan, but however you argue you can’t say that rising US interest rates are causing the $ to appreciate against two of its major trading blocks. So the question comes down to is there a correlation between raising rates and currency strength. Most folk will tell you there is, but the data so far isn’t agreeing. The calculus of inter market relations is complicated and subject to many variables, but the oft quoted argument of raising rates equals currency appreciation is, at least for now, not correct as regards the US $. Later in the economic cycle when the Fed will be fighting inflation there is more likelihood of raising rates raising the $, but for now? Disciples of monetary theory, one of the most vocal is Mike Norman who writes on the Real Money (sub site) argue that conventional thought is wrong and that raising rates will cause currencies to weaken (at least at the start of the cycle) for the reason that rising rates puts more money into the economy, leading to inflation and to the devaluing of the future worth of the currency. i.e. raising rates is a reason to sell the $, not a reason to buy it. It is very hard to go against what the media say and many false things get near religious fans, but it is often by going against consensus that good money is made. Having just read your lengthy response above, I am none the wiser as to what your answer is to the 3 questions that were asked. "media" or "disciples of monetary theory" that you quote. Those are the answers if we have reasonable markets, no huge geopolitical events. It is never as simple as one would like. E.g. The £ has already had a big sell off, so the natural equilibrium move is for the £ to rise, raising U.K. rates will slow that rise. Similarly if LePen wins & France breaks from the Euro zone, one expects the Euro to tank against major trading nation currencies. With inflation rising, one should also expect gold to rise too. An interesting graphic and I could also add that the property market seems over buoyant, often a sign that we are due a down turn. My feeling is that as we have gone through Brexit and effective devaluation and not seen much in the way of falling economic data and are only now beginning to think about raising rates from historically low levels, all suggesting to me that this economic cycle has further to go. If as I believe higher rates will lead to more money in the system this may counter the data from your chart as might increased exports from the devalued £. If, as your chart suggests, consumer spending is falling off and continues then I will be wrong. If we are heading into a down turn I would expect this to show in other measures like pmi too. It would be interesting if anyone can post about a wider range of economic indicators. I believe that you have misread the chart Ody, it shows a decrease in the saving rate rather than consumer spending. All things being equal - that would suggest an increase in consumer spending rather than a decrease. 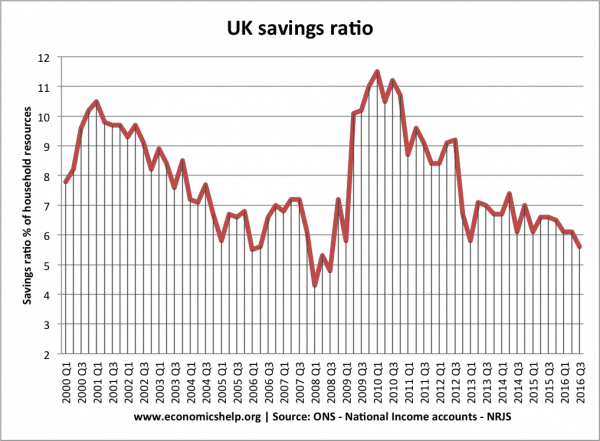 It shows that the savings ratio has dropped to historical levels at which point, spending tends to slow. So yes it says that spending is now large, but that it is likely to fall off, if the historic norms are adhered to. So the original point, about being closer to a new slow down than the last, would be valid using this metric.